His Holiness Gangteng Rinpoche will lead the Kagye Drubchen in Russia from 7 to 14 of March 2019. Kagye, or the Eight Commands for Sādhana Practice, is a very important and vast cycle of teachings, entrusted to Guru Rinpoche and the Eight Vidyādharas of India. These teachings got transmitted to Tibet and form the core of the Nyingma system of Mahāyoga practices. Drubchen is a unique and rare event. Participation in a Drubchen is a great luck and exceptional possibility. It brings benefit for practitioners, as well as for the place and for all sentient beings around. Tibetan word “drub” is translated as “siddhi”, “achievement” or “fulfillment”, whereas “chen” means “big” or “vast”. Thus, Drubchen should be understood as a practice in which great achievements are realized. This exceptionally powerful Buddhist practice includes all skilful methods of Dharma. During a Drubchen the participants make offerings to all sublime beings, they do visualizations, mudras, sing Dharma songs; the sacred «lama dances» are performed. Within the seven days mantras are recited 24 hours a day. The ritual goes on unbroken. It helps for practitioners to overcome obstacles and obscurations and to develop pure vision. It is said that few days of Drubchen are equal to three years of solitary retreat. 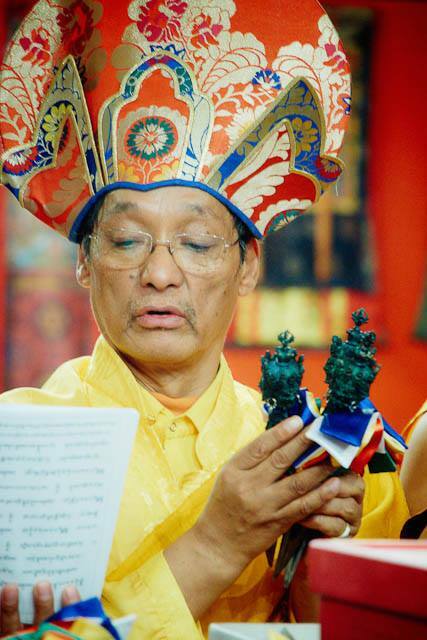 His Holiness Gangteng Tulku Rinpoche will lead a Drubchen in Russia for the fourth time. The teacher will be accompanied by more than twelve assistants. Gangteng Tulku is the Body emanation of the king of tertons (revealers of spiritual treasures) Pema Lingpa, and a holder of his teachings. Rinpoche is one of the most renowned Buddhist masters of Bhutan, where he guides over more than 35 monasteries, as well as Buddhist universities and retreat centers. The Kagyé mandala is constituted by five wrathful wisdom deities, who represent the enlightened body (Yamāntaka), enlightened speech (Hayagrīva), enlightened mind (Yangdak Heruka), enlightened qualities (Amritakundali) and enlightened activity of all the buddhas (Vajrakilaya), as well as three semi-worldly or worldly deities: Mamo Bötong, Jikten Chötö and Möpa Drakngak. The central deity of the mandala is Chemchok Heruka. One of the main intentions of holding this Drubchen is to establish peace and harmony throughout the world. We invite everyone to participate, regardless their knowledge and Dharma experience. May it benefit all sentient beings! The Drubchen will take place in the Kunsangar retreat center near Moscow. As in previous years, our sangha is glad to help our guests with preparing invitation letters as well as to get to the place. The texts and translation will be available in Russian and English. See you at the Drubchen!